– Specialist Divorce and Family Law Solicitors in London, England, UK. 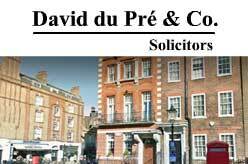 David du Pré & Co mainly handle cases in Central London and the Greater London area, but also covers England and Wales or handle international divorce cases. 23 Bedford Row, London WC1R 4EB, United Kingdom.